I love Hawaii. Few destinations in the world offer as much variety, as much depth and breadth of experience, as much visual pleasure, as do the Hawaiian islands. Born of cataclysm in the middle of the Pacific Ocean a million or so years ago, the islands today offer so many options, I always threaten to stay. When my vacations there wind down, I find my To-Do list already growing for the next visit. There are the hikes near the volcano that I still want to take on the Big Island of Hawaii, the shops I want to visit on Oahu, the breathtaking walks along Kauai’s Napali coast. But, of all the Hawaiian islands, I find myself most irresistibly drawn back to Maui. Dwarfed by its larger sister, Hawaii - known as the “Big island” - Maui is the second largest island in the chain. But what it lacks in size it more than makes up for in variety. I love being able to drive from an upscale, urban mall to a 400-foot, wilderness waterfall in little more than an hour. Maui is roughly 45 miles long by 30 miles wide at its widest point. But within that territory are ten thousand foot elevation changes, desert areas, tropical rain forests and endless seacoast. 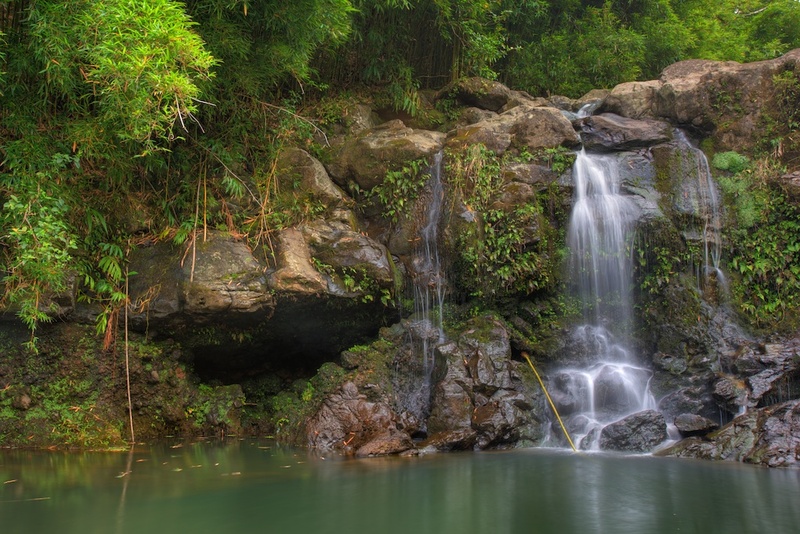 Rainfall on the northwest side of the island, within the West Maui Forest Reserve, averages more than 300 inches a year! Yet drive 45-minutes down the coast to Wailea and rainfall averages a desert-like 16 inches a year. Shopping on Maui is nothing short of world class, with major retailers well represented and big-box stores abundant. But, get real. You’re not going to Maui to shop at Wal-Mart. One of the joys of shopping on Maui is in exploring its small towns, walking up and down quaint streets and shopping the one-of-a-kind boutique arts and crafts stores. And then there are Maui’s restaurants. The island is a virtual smorgasbord of foods, from the typical fast food joints to 5-star gourmet experiences from the likes of Master Chef Wolfgang Puck (Spago Restaurant at The Four Seasons Resort in Waimea). In short, Maui offers everything I could possibly want, comfortably wrapped in a manageable island setting. Despite commercial developments over the past few decades, Maui’s shoreline is still mostly undeveloped, much of it forever so. Huge tracts of land are either state or national parkland. Vistas are expansive, the clouds are beautiful and every few miles you’ll want to jump out to take pictures. That is why I find driving on Maui to be mostly a joy. Notice I say “mostly.” There are trouble spots, like on a recent weekend evening when my wife and I tried to drive to Lahaina to meet a couple of friends for dinner. As they say, fuggedaboudit! Because of congestion on the narrow road, we were 45-minutes late. But thanks to the laid-back island attitude, the maitre de sat us promptly. There are also the typical minor traffic backups in and around popular shopping areas, like Kahului’s malls. But for me, there are few drives in the world that can compete with the famous (or infamous) Road to Hana, a mostly elevated, sometimes hair-raising 55-mile drive along the coast with non-stop, stunning views of ocean, lava fields and tropical forest. No matter what the guidebooks estimate the drive should take, I literally double that so I have time to stop frequently, take photos, and hike closer to the many waterfalls and crashing ocean waves I pass. If you’re afraid of heights, be warned. At points along this drive you may have to peel your fingers off the steering wheel. A simple solution I employ is to drive southeast from Kahului. That way I stay on the inside lane and stretch my supply of anti-anxiety meds. Another of my favorite drives is the 38-mile inland route to the tiny town of Kula. I savor the commanding views of the island that open up as we climb 10,000 feet toward the Haleakala volcano. My wife and I always plan extra time to stop at the roadside fruit stands. Like their counterparts throughout the islands, I guarantee you will never find fresher or tastier fresh fruits anywhere. My personal favorites are Maui’s tiny apple bananas, which have a distinct, crisp taste. Of course, Maui’s sweet pineapples are world renowned, but the mangoes and papayas are every bit as succulent. This past winter, we took an early morning drive to the Kula Lodge, a Bed & Breakfast near Haleakala National Park that boasts a sweeping coastal view encompassing Wailea, Kihei and (almost) Lahaina. We ate a delectable breakfast of eggs benedict and their signature home fries, chased by cup after cup of steaming, black Kona coffee, all the while soaking in the view through the oversized windows. When we were done, we ambled through the Lodge’s colorful wildflower gardens and their lush tropical fruit trees. One final hint about driving on Maui. Whatever the season, take along a jacket or rain parka. As you pass from jungle to open areas, valleys to mountaintops, the weather can change quickly, with wind chill drops of as much as thirty degrees. On our third day on Maui, we started out in the early morning and took the Road to Hana in time to get to the Ohe’o Gulch parking area before lunch. From there we hiked to the picturesque, 400-foot tall Waimoku waterfall, a moderate, but long hike that winds through a sacred bamboo forest. There is simply no way to describe how dense the tree growth here is. A small group of teens hiked behind us and even they were awed into silence once we entered the depths of this magnificent preserve. All around us bamboo trees towered, blocking out the sun and creaking and groaning each time the ocean breezes blew across the mountain. We arrived at the towering waterfall in time for a leisurely lunch, admiring the cascading falls and the mini-rainbows they produced. Refreshed, we headed back for the car. But a chance encounter with a friendly local couple rewarded us with one of the highlights of our visit. They steered us past a fork in the path, where a sign warned of dangerous conditions. They assured us that if we were cautious, we would be in for a treat. Carefully, we edged past the sign and within a hundred yards, we came upon a series of pools that magically originated out of the rock face of the mountain, each one as placid and inviting as the next. We were stunned by their beauty, protected as they were by a heavy forest canopy. As we approached the last pool, we noticed that it cascaded over a precipice. We approached very cautiously and in a few steps we were stunned to see that we literally stood atop a 200-foot waterfall. Below us lay the most verdant valley we have ever seen. Our eyes soaked in the stunning view, with the Pacific Ocean in the distance. Yet another series of waterfalls plunged down the side of the valley to our left. With no one else around, it felt like a scene from prehistoric times. From serious climbs to leisurely strolls, Maui is hiker heaven. On the sixth day of our stay, we both felt tired, so we took a relaxed hike in Iao Valley State Park, conveniently located near the narrowest part of the island and easily accessible from most population centers. We decided to hike to the Iao Needle, a natural spire that juts up from the valley floor and was considered a sacred site by the ancient Hawaiians. It was also the site of major battles between tribal rivals and there are burial grounds within the park that add to its religious significance. Beyond hiking, the active lifestyle reigns supreme on Maui. Horseback riding, surfing, bicycling, golf, hang-gliding, parasailing, kayaking and SCUBA diving adventures can be found all over the island. Adventure outfitters are readily available for those who want to avoid the hassles of arranging all the details themselves. Probably the most sought-after Maui experience for vacationers is whale watching. And no wonder. Every year, family groups of humpback whales come to the Hawaiian islands to bask in the warm waters, feeding on the abundant krill and seemingly vacationing themselves. Young whales frolic with each other, rolling over and over, while their parents perform aerial acrobatics as they rocket from the water. My wife and I chose a wonderful sunset whale watching trip out of the harbor in Ma’alaea Bay. If it’s your first whale watching excursion, I recommend booking a trip through the Pacific Whale Foundation, although nearly every boat captain can place you alongside whales during the December through May season. The Foundation is a non-profit organization and part of the proceeds fund whale research. On this particular evening, with plenty of sunlight still left, we were treated to more than a dozen whales breaching out of the water, landing with thunderous splashes and huge plumes of water. We got close enough to one family group to hear them exhaling through their blowholes, the mists lingering around the boat. With the sun setting, we headed back to the dock, highly satisfied with all our sightings. Suddenly, there was a massive explosion from the water just 100 yards to our left and two adult females breached in unison, a spectacular finale to a perfect cruise. After our cruise we drove 20 minutes to Lahaina, which is one of our favorite haunts on Maui. Lahaina is an old whaling village, a true irony on an island that draws considerable revenue from preserving whale habitat and serving up whales nowadays through binoculars and cameras. Today Lahaina is a tourist paradise, chock full of unique boutiques and great restaurants. 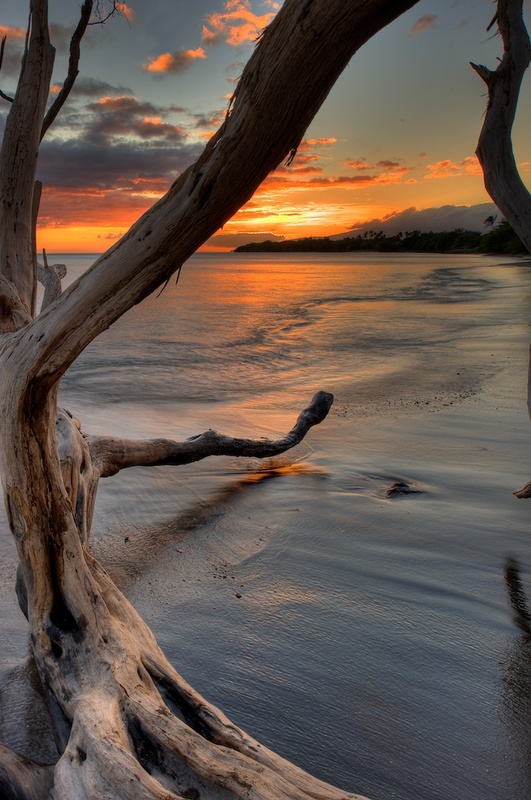 One of Lahaina’s most famous attractions is its banyan tree, the largest in the state. It’s aerial roots have extended every which way for the length of a city block, so that it is perennially shady under its massive branches. It is an incredible sight, well worth seeing. But, heed my warning. Do not stroll under its branches after nightfall. The humongous tree is home to literally thousands of birds. Their collective chattering when they return each evening is nearly deafening. As my wife and I ate dinner directly across the street one night, two young couples walking under its canopy emerged nearly white-haired, their clothing similarly splattered. Lahaina has more than its share of good restaurants. One of them, Pacifico, is right on the beach and prides itself in fresh caught seafood, exquisitely prepared by their chef. On our last night in Lahaina, we made reservations for an hour before sunset and sipped an excellent wine as we watched the sun sink into the Pacific Ocean. After dinner, we strolled down Front Street, popping into the various galleries and arts and crafts stores. We couldn’t resist a macadamia nut ice cream cone at Lappert’s, one of our favorite Maui rituals. Between hiking, whale watching and scenic driving, we sometimes have to schedule beach time when we’re in Maui, which is a little nuts since Maui’s beaches are consistently rated among the Top Ten on world lists. All beaches in Hawaii are accessible by the public, even those in front of upscale beach resorts. Most of Maui’s coastline is still rugged and inaccessible. But, if the beach is sandy and you can get to it, you can use it. One of the most incredible things about Maui’s beaches is that you can often whale watch right from your beach chair. The water immediately off shore is deep, so whales tend to hug the coast in their search for food and protected play areas. We always bring along binoculars and scan for spouts, then follow their antics. If you keep your eyes open as you drive, you will often see cars pulled off the road on bluffs, where people gather to whale-watch. Snorkeling, a big tourist pastime should only be attempted from recommended beaches. Currents and wave action can be severe in places. But, given the right beach, snorkeling is incredibly inviting. I remember the very first time I dived in Maui’s waters. My host, a marine biologist, apologized for the poor underwater visibility that day, which was at least one hundred feet, since I could see our anchor clearly on the bottom. Back East, I’d be happy with twenty feet visibility. Rather than carry diving equipment from the mainland, my wife and I rent from one of the many dive shops around the island. Daily and weekly rental fees are quite reasonable due to the intense competition among shops. But, let’s face it, it’s no secret why any of us really go to the beach. To that end Maui offers up the world’s best beach napping experience. Slather on the sunscreen, pull your cap over your eyes, take a deep breath of the salt air and lay back. Maui’s rolling waves and gentle tropical breezes will do the rest.